REWIND – Scott Brown: “Shame on Chuck” | can i just finish my waffle? The tone has changed a bit since the 19th election, but it’s kinda fun to look back at the ridicule the tea parties have suffered. Below, watch Rachel Maddow and Ana Marie Cox mock “teabaggers” prior to the Tax Day April, 2009 protest. Notice the smirk on her face. She is so cute, huh? Tom Friedman is just saying “he doesn’t sense a positive agenda” from the tea bag movement. Notice: The positive agenda is to change Washington, D. C., by use of the ballot box, seat by seat. That is the agenda. 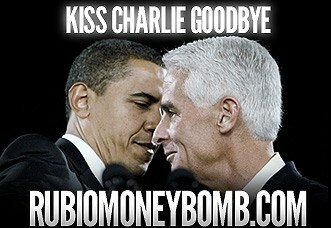 One to watch: Crist/Rubio in Florida. Brand new poll today: showing 47 Rubio/44 Crist. This is the seat vacated by the resignation of Mel Martinez. Crist appointed George Lemieux to basically hold the seat for him. Ree, I think if the teaparty movement were clearly defined by overpaid, egotistical, opinionated, “reporters” they might report it is a group of homogenized AMERICANS. all ages, races, creeds, who all believe & embrace INDIVIDUAL RIGHTS over any GROUPS’ “rights”………INDIVIDUAL RIGHTS don’t need much legislating now do they & when all persons rights are recognized WE ARE ALL PRETTY MUCH EQUAL THEN TOO, NOW AREN’T WE? Scott Brown for president? Maybe not too far fetched. Since the Scott Brown win I have not heard the phrase “Teabagger” being used. It’s not because those same Reporters weren’t relishing using it as an epithet for Average everyday Americans. Their Corporate Masters called them off because of the Scott Brown win? I think tonight’s State of the Union Speech will have a strong Clintonian flavor. It’s NYT week at You Have To Be This Tall To Go On This Ride. Why does Maureen Dowd compare our President to Mr Spock? The State of the Union “Rescue, Restore, Rebuild. Mr Spock makes his move. well, I have stated many times that the “media” is CORPORATE OWNED & that their talking heads are basically chattel…….I believe they are pretty much told what to “report” & HOW to “report” it…….if the term “teabagger” is not being used, I believe that is for DAMAGE CONTROL…………we have have been treated like children for many years now & I guess many kids are growing up & questioning authority………..Coulter stated on some show the other night the teaparty movement was basically conservatives but didn’t expand the observation……..
Jon Stewart rips Obama about the teleprompter in the class room. LOL.. Okay, I might tune in tonight for a few minutes to see the crow jump up and down out of her seat with her frozen smile ala the Joker from Batman…bet she’s getting ‘freshened’ up before the big night. The president of the United States reprimanding the Supreme Court in a SOTU address with them sitting there is just beyond belief. What an arrogant son of a gun he is. I didn’t see any recognition at all of his first year failure on every point. And if he moved to the center one little bit I did not see it. Following up, Spock’s favorite phrase, Fascinating, well no not really. Yeah, I’m Just Not Feeling It. What does the President need to do for a bump in the polls hint this isn’t it. Did The Phrase the President used “I won’t Give Up, Don’t You Give Up” Sound familiar to anyone else? Train “Calling All You Angels. My husband pointed out we don’t hear Global Warming anymore either, we hear Climate Change….that was intentional because of the Global Warming Hoax. Climate Change, well duh the Earth has a climate, and it’s been changing ever since. My husband said, that is their way of not being called on the AWG Hoax. Last night the President said, he was going to “Fight Climate Change” How? How does one fight mother nature and make her stop changing the climate LOL! There was somewhere around 100 I’s, but maybe that’s not too bad for 72 minutes, I don’t know. I have felt it all along and it has not changed, he is on the outside looking in at us and he is disgusted by what he sees. He just can’t seem to get this nasty democracy out of the way so he can fix us all. If not fix us, at least lock us up somewhere so he can shut us up and he can get on with his master plan. Or maybe I should say he is looking down at us from somewhere in the air and he talks to us like we are not only children but retarded children. But it is beyond defiant to take on the Supreme Court. That is sick. Only Obama could set up something that would get the MSM mouthing off at the Supreme Court – in order to defend him. He is the Master Divider of All Time. I don’t care how much you disagree with the decisions, and there have been plenty of times I disagree, it is totally inappropriate for the president to do what he has done. In effect, he is tearing down democracy, brick by brick, in every way he can. If the democrat party keeps following Obama, he is going to lead them right off the cliff. I think they are in pretty much of a bind and I wonder what they will do. Because he may be safe for another three years, but they are not. MsM, when I think back a year ago, there were a lot of uninformed people and so in that respect we are a good deal better off today. I am more than a little stunned that the president would take on the Supreme Court and then all the dems stand up and applaud while they have to just sit there. Just awful and he did it on purpose because he prefaced his remark with something about with all respect to the separation of powers. It just seems to gall him – he can’t control the Court and he can’t seem to get congress to do his will, even though he has the cards stacked in his favor. He just stepped way out of line with that little maneuver. He wants to be a ruler rather than a president. Isn’t it some kind of mental condition when you can’t refuse to face reality and refuse to take responsibility? Bella, I think we all need to hang on for the ride, but as midterm elections loom, more bodies will be tossed under the bus, fingers will be loaded, circular firing squads will commence & I’m willing to bet that those up for re-erection will NOT expend all their political capital for programs so unfavorable with their constituency………The condition by the way simply put is denial………without conscience, morally bankrupt, totally inept to make it on one’s own………. I got to do it as I am honeing my political incorrectness……………..LOL LOL LOL LOL til Nov 2010! GLEN BACK ON………GOTTA GO GET BRAINWASHED, but you know it does help if you have a brain, of course………LOL LOL LOL LOL! Chris Matthews is so cute. Forgot Obama was black for an hour – lol too funny. A whole hour mind you. The progressives are such hypocrites.